This outstanding collection includes all of the wildlife sculptures ever made for bronze casts by Missouri’s famous artist-cinematographer-biologist Charles W. Schwartz. Owned now by the Conservation Foundation of Missouri Charitable Trust, the sculptures convey enduring admiration for the beauty in nature and the wonder of wildlife. The Foundation saw this acquisition from a private individual as an opportunity for all Missourians to share this experience, and also, as an opportunity to teach about the wonder of wildlife. 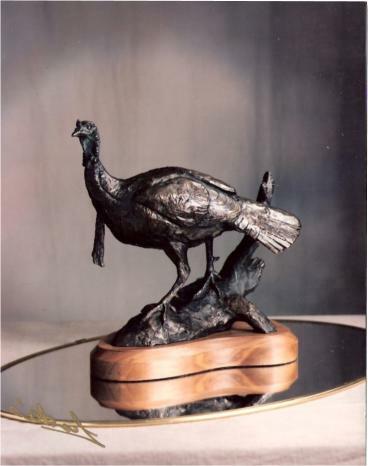 The sculptor’s 40-year career with the Missouri Department of Conservation gave national exposure to his wildlife art and photography. His award-winning wildlife films set the standard of his day, his artwork in the pages of Missouri Conservationist and other magazines introduced many admirers to a greater appreciation of our natural world, and his wonderful murals still greet visitors to the Missouri Conservation Department’s headquarters in Jefferson City. Very early in his career, Charles Schwartz was chosen to illustrate Aldo Leopold’s Sand County Almanac, one of America’s best known conservation books. His legacy of wildlife art is unsurpassed in scope, beauty and biological accuracy. With his wife Elizabeth, they collaborated on numerous books, articles, films and documentaries and conducted pioneering research on prairie chickens, box turtles and the game birds of Hawaii. One book, “The Wild Mammals of Missouri” is widely acclaimed as the definitive work on its subject and is the all-time best-selling book of the University of Missouri Press. Although his art and cinematography are known to most Missourians, his sculpting is not, for it was only after his retirement from the Department that he really immersed himself in this creative outlet. In time he created fifteen bronzes that comprise this remarkable collection. Starting from a drawing he would make a three-dimensional wire-framed model before actually creating his work in sculptor’s clay. He then made a mold using the “lost wax” method. Only a very few castings were struck from each mold in an expensive and time-consuming process. The end result is this exciting collection that forever bears tribute to Charles W. Schwartz. When not on loan, the collection is on display at the Runge Nature Center in Jefferson City.